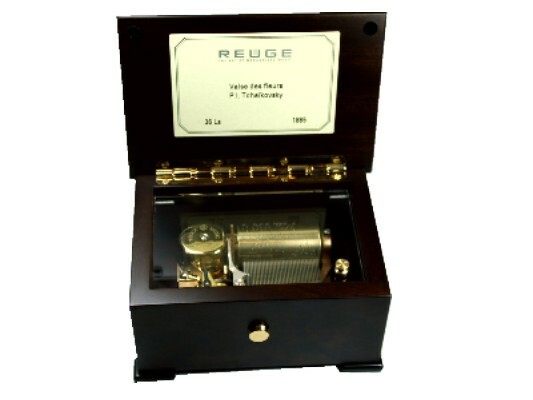 A very traditional inlaid music box, manufactured in Switzerland by Reuge. This musical box is fitted with a 36 note movement, which plays one tune. The musical movement is under a clear cover and the box is finished in a natural satin lacquer. This is an excellent small music box, with beautiful marquetry design. The musical movement is switched on and off by a slide button on the front of the box. This enables the music box to be played whether the lid is open or closed. It is wound from the underneath by a key. Please note - although we take as much care as possible to show pictures of the actual product, because this is a hand made product from wood, the colours may naturally vary slightly from those shown.